In our office, we have a training center for engineers and engineering students to teach how to operat, connect and program PLC's. Future Hi - Tech has no associations with any particular brand but instead has plenty of expertise of many brands, such as: Siemens. , WF cards, coupling cards. Siemens S7 line: all CPUs, input and output cards, power supplies, communication cards, etc. 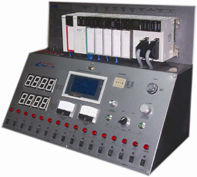 Power supplies, operating panels and programming equipment is generally simple to test. Replacement films are available for many Siemens operating panels [OP5, OP15, OP25, OP35, OP7, OP17, Op27, OP37]. Standard test benches with motors are available for frequency regulators [Danfoss, Lenze, etc. ], DC regulators and servo drives. Future Hi - Tech has a large warehouse with new and used spare parts, tested equipment modules and complete systems. Click on the latest stock list to check which parts are available at any time. Future Hi - Tech also carries many spare parts for 'end of life' systems. In the unlikely event of Future Hi - Tech not having the parts required for your system, the specialised Future Hi – Tech purchasing department will be pleased to search world wide for the equipment or parts you may require. On customer specifications, the equipment will be refurbished and tested before delivery. This services prevent hasty and risky investments for the customer. When it comes to repairs, Future Hi - Tech works professionally and quickly. In urgent cases, we first check whether the component is in stock, so that Future Hi - Tech can quickly provide you with a replacement. If this is not the case, the repair work will begin immediately. Spare parts of cards repaired urgently are then delivered by courier to the location of your choice in Europe and further a field.